We know about Caribou, FKA Twigs, Django Django, Run The Jewels, Hudson Mohawke, Spector, Fryars, Tuneyards, Stealing Sheep, Ride, Patti Smith ,Baxter Dury, Eagulls, Gaz Coombes, Hookworm and Savages plus everything else on the posters this week it was announced that 2014 Mercury Nominees JUNGLE will be hosting The Bandstand with DJ sets from themselves as well as Beaty Heart, Django Django, Oceaan, Tei Shi and XL DJ’s. There’s a Spotify Playlist available for those not familiar with everyone playing … and there may be even more announcements as the event draws closer. As is the case with these events in London’s Victoria Park, the tubes will still be running after the last act and the lucky few who reside in the area can all be tucked up snuggly in bed ready for a good night’s kip between the two days entertainment. 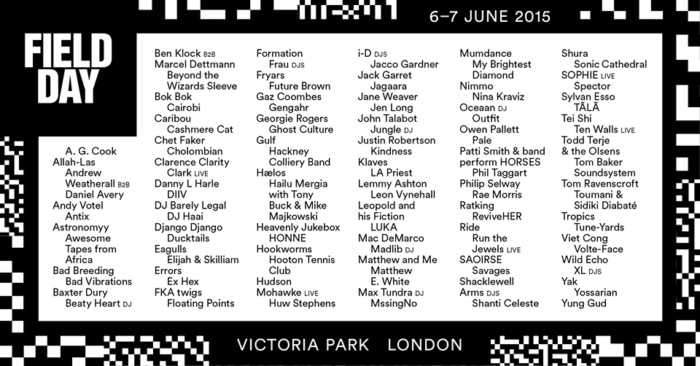 Field Day is also on Facebook and they tweet as @fielddaylondon.